Full music scored readings of H.P. Lovecraft's Fungi From Yuggoth sonnets and other poems. Read by William Hart. Composed by Graham Plowman. 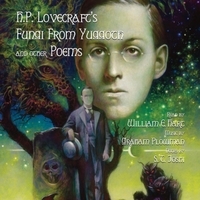 A 21st-Century audio production of HPL's Fungi From Yuggoth as read by William E. Hart and with the eerie atmospheric music scored by Graham Plowman doesn't stop there: we've filled the CD with a dozen more of his best Weird Poems!